By 1867 a revolutionary development in architectural design was appearing in the neighborhood that a century later would be called Soho: cast iron facades. The strong and relatively inexpensive material allowed for enlarged window openings and was considered fireproof. But when John Lawrence commissioned architect John Kellum to design a store and warehouse to replace the old Lafayette Hall at No. 597 Broadway that year, he opted for marble. Kellum’s finished structure, however, featured tall, expansive windows that flooded sunlight into the upper floors. The slender pilasters with their intricate carved capitals which separated the openings were unexpected in a stone structure—making it appear that Kellum was imitating the new cast iron buildings nearly as much as those were imitating marble and limestone. Carved cornices, each supported by a single foliate bracket, separated the floors. Above it all Kellum added an attractive overhanging cornice with French Renaissance entablature. The building ran through the block with entrances on Mercer Street. The retail store was home to a dry goods establishment while among the tenants upstairs was Theodore Roberts, a liquor dealer. When Roberts was discovered selling alcohol on election day in April 1867 he was arrested and held in the Jefferson Market Court by Justice Ledwith with a $300 bail. The street level store soon became home to Mitchell Vance & Company, manufacturers and sellers of high-end lighting fixtures, bronzes, clocks and ornamental metal work. Established in 1854, it catered to the carriage trade with expensive goods like gilt bronze chandeliers made in its 10th Avenue foundry and factory. 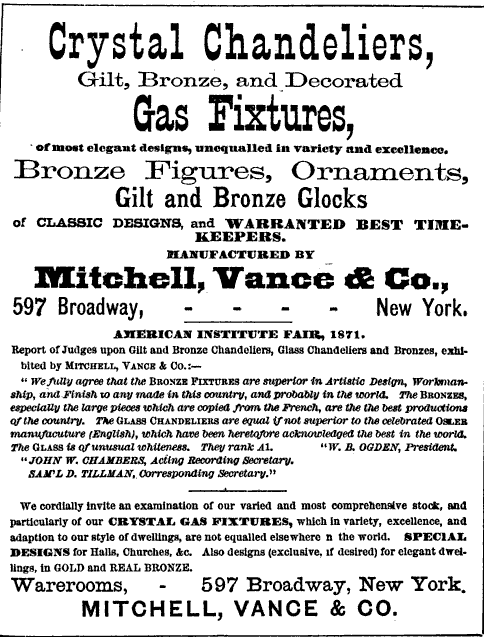 An advertisement in The New York Tribune in 1872 lists a variety of high-end products. Mitchell Vance & Company moved on in 1877, having erected its own building at No. 836 Broadway. The store was home to Henry Rogers by 1885 when a small fire broke out the evening of January 8. As quickly as it appeared the fire was extinguished and the excitement was over. Around 2:00 in the morning the fire reignited and raged throughout the structure. The New York Times reported that “at that time it seemed as if the building would be destroyed.” But although Henry Rogers’ store was wiped out, the white marble building survived. As the millinery district rapidly overtook the Broadway area, political organizations moved in as well. In 1904 a Democratic organization, the Commercial Travelers’ League, was here. Directly across the street was the Roosevelt and Fairbanks National Commercial League. As the Mayor entering his carriage, the Republican meeting in support of Hearst was ending across the street. A Hearst supporter poked his head into McClellan’s carriage shouting “Three cheers for Hearst!” By now the Democrats were filing out as well and the two groups faced off. Almost as proof of Parish’s theory, No. 597 Broadway was sold at auction that year for $102,750. It was assessed at $130,000. In 1922 the street level was home to the bakery and store of the Broadway Pastry Shop. Davis Weiss was the “chauffeur” of the shop’s delivery truck and a routine delivery turned into anything but ordinary on April 14. As Weiss drove towards the corner of 34th Street and 2nd Avenue, 58-year old Emma Webb was crossing the street with her granddaughter, little 8 year-old Madia Pechick. The middle years of the 20th century were unkind to the Soho neighborhood. Cast iron masterpieces sat rusting and grimy, their former high-end showrooms now home to factories and cheap outlet stores. The store front of No. 597 was brutally altered and the façade was stained and covered in decades of soot and grunge. The geologist was stunned when the cleaning revealed John Kellums gleaming white marble. On October 5, 1996 the 5,000 square foot commercial area became home to Kenneth Cole, whose opening party here had a political theme, “Get Out and Vote.” Today Billabong, a trendy clothing store fills ground level. Above, the white marble facade looks much as it did in 1867. The building still has an identity problem, however; instead of being mistaken for sandstone, it is most often assumed to be white-painted cast iron.